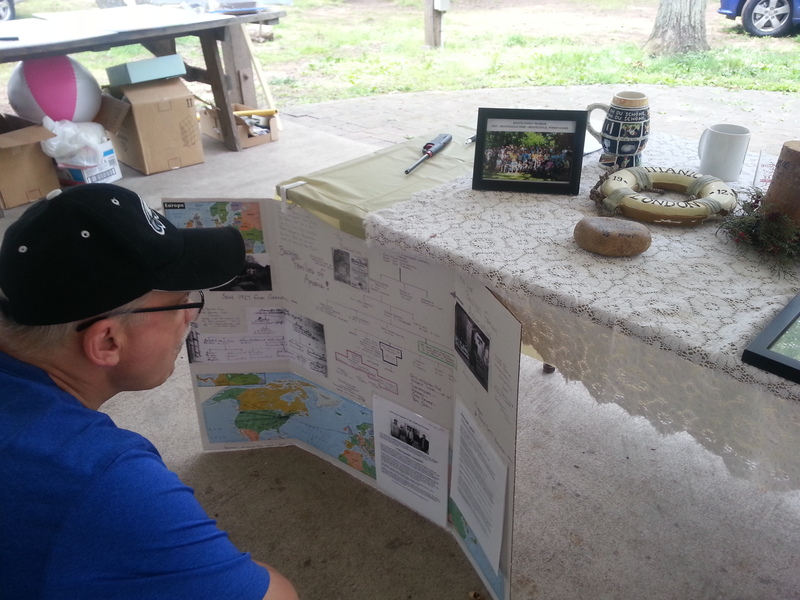 About a month ago my husband and I attended the Bechtel Family Reunion at the Swamp Picnic Grove near New Hanover Lutheran Church in Gilbertsville, PA. While the focus of this reunion was on the descendants of the six Bechtel men who (along with their families) immigrated to Pennsylvania in the early to mid 1700s, it was open to all who trace their ancestry to any Bechtel ancestor — including any variant spelling. We had a very enjoyable afternoon meeting and speaking with distant cousins and sampling all the wonderful PA Dutch side dishes and desserts that attendees brought to accompany the catered main course. Judy Gilson, the organizer, brought quite a large assortment of memorabilia, documents and photographs, and others did as well. The day was rounded out with music, games for the children and a professional photographer. It was especially nice to hear the family stories from the various attendees. 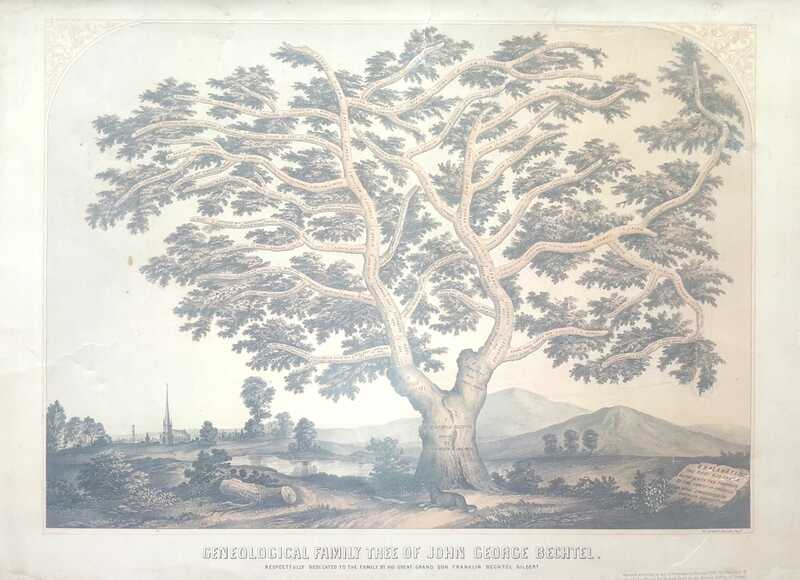 I was personally excited to find that among Judy’s Bechtel memorabilia was a copy of the John George Bechtel family tree produced by great-grandson Franklin Bechtel Gilbert in the early to mid 1860s. Franklin Gilbert was born in Montgomery County in 1826 to Matthias Gilbert and Hannah Bechtel. He grew up in Philadelphia and became an upholsterer. He joined the Union Army in the Civil War and later became a physician. In 1867 he traveled to Europe. One of the purposes of the trip was to secure any inheritance related to the estate of his great-great grandfather Bechtel. Family lore is that John George Bechtel, the immigrant and the great-grandfather of Franklin Gilbert returned to Europe to settle his father’s estate circa 1748. He never made it back to Pennsylvania as it was said that he died on the return voyage. Thus, about 120 years later, Franklin Bechtel Gilbert was on a mission find what became of the Bechtel estate. Prior to his trip Franklin made an effort to identify and contact all of John George’s descendants for written authorization to act on the entire family’s behalf in securing the inheritance due them. I can only assume that he was unsuccessful in his endeavor as no family stories exist that speak of his success. Fortunately for the John George Bechtel descendants who are family historians, Franklin Gilbert published an ornately detailed family tree depicting three to four generations of descendants. I have been trying to find a copy of this tree for several years and was absolutely thrilled to find it among Judy’s documents. A photograph of the tree appears below. Please contact me if you would like to view a hi-resolution copy. Is Mary (Keeley) Lapp a Descendant of Valentine Keely of Skippack?? One of my research projects involves the identification of the descendants of Valentine Kiehle/Keely/Keeley who immigrated in 1728 and settled in the area of what is now Skippack, Montgomery County, PA. (He is my 6x’s great-grandfather.) So a couple of years ago when Mary (nee Keeley) Lapp showed up in the then new Pennsylvania and New Jersey Church and Town Records on Ancestry.com, I immediately looked for her in my database. The Ancestry record provided the information that she was born September 12, 1838, died Oct 7, 1919 and was the daughter of Henry and Mary (Poole) Keeley. Unfortunately, not only was Mary missing from my Keely/Keeley database, but I had no Henry Keeley-Mary Poole couple either. Nor could I find her in the census under either her maiden name or married name. Vexing. So Mary went onto a back burner for a while. Fast-forward to a couple of weeks ago. As many of you may know the early years of Pennsylvania death certificates (currently 1906-1944) are available online at Ancestry. (Note to researchers: This collection is available as part of the US subscription but is also free to Pennsylvania residents when accessed through the PA portal.) While mining this collection for Keely/Keeley records I once again came upon Mary (nee Keeley) Lapp. Some key information gained from the death certificate was that Mary and her father Henry were born in Pennsylvania and her mother Mary Poole was born in Massachusetts. The death certificate further stated that prior to being admitted to the hospital in Norristown (where she died) she lived in Graterford, Montgomery County, PA.
Armed with the information that she supposedly was born, died and had a residence in Pennsylvania prior to her death, I once again I looked for her in the US Federal Censuses. And although I tried all sorts of spelling and misspelling variations of Keeley and Lapp, I was still unable to find Mary. Not in 1910, 1900, 1880, 1870, 1860 or 1850. Rejecting the possibilities that she avoided being enumerated in the census because she spent the bulk of her life abroad or that she and her family were somehow skipped over each and every decade, I went back to the death certificate to look for more clues. The informant on the death certificate was Mrs. Samuel Koons of Graterford, PA, and she was identified as a daughter. Hoping to find more about Mary by finding out more about her daughter, my first goal was to determine Mrs. Koons’ first name by locating her in the 1920 census. I was really hoping that since she lived in Graterford in October of 1919 that she would still be there (and be enumerated) when the 1920 census was taken. The closest match was Samuel Koons, aged 68, and his wife Mary C., aged 60, of Perkiomen. They were also in Perkiomen in 1930 with Samuel aged 76 and Mary C. aged 71. But in 1910, Samuel, aged 56, is enumerated with wife Lizzie C., aged 54. And here I hit a snag — not only is the first name of the wife different, but the age is inconsistent. Taking a step back, the 1930 census indicated that Mary C. was first married at age 19, which would have been about 1878 and that Samuel was first married at age 38, which would have been about 1896. Thus Mary C. was married to someone else prior to marrying Samuel. Based on the 1910 census Samuel had a prior marriage as well. This, of course, leaves a window of between 1910 and 1920 for the marriage of Samuel and Mary C. In searching further the Philadelphia marriage index shows a 1915 marriage between Samuel Koons and Mary C. Mishler. A census search for Mary C. Mishler yielded a 1900 census for a widowed Mary C. Mishler, aged 41, living in Philadelphia with a son Herbert, aged 20. Going back, the 1880 census had a Silas Tucker, aged 40, with son-in-law Thomas Mishler, aged 25, Mary Mishler, aged 21, and Herbert, aged 1 in Lancaster, PA. In 1870, Silas Tucker, aged 36, Mary A., aged 30, Mary C., aged 11, and William H., aged 9, are enumerated in Lancaster. And in 1860 Silas Tucker, aged 24, Mary A., aged 21, and May [sic], aged 1, are once again in Lancaster, PA. So presumably, Mary (nee Keeley) Lapp has been now been found in 1860 and 1870 living in Lancaster with her first husband, Silas Tucker. A little more digging shows her living in Philadelphia in 1880 with second husband Samuel Pearson and son William Tucker, aged 19. She is also in Philadelphia in 1900 as a 59 year-old widow and in 1910 as a 71 year-old widow. (Yes, the ages are a little off, but I am fairly certain it is her.) In addition, the Philadelphia Marriage index shows a 1911 marriage between Mary Pearson and George W. Lapp. So although part of the mystery of Mary (nee Keeley) Tucker Pearson Lapp is solved, questions still remain. Where was she in 1850? Where in Pennsylvania was she born? Is she a descendant of Valentine of Skippack? If you have any further information on Mary, I would love to hear from you. In the meantime, I’ll keep looking and hopefully I will soon be able to get a handle on her parents and ancestry.